"There's one thing I'd like to know. Am I following you, or are you following me?" While Georges Simenon's detective character Inspector Maigret has been one of the most persistently popular sleuths of fiction for many years, he hasn't made the translation to the big screen all that often. 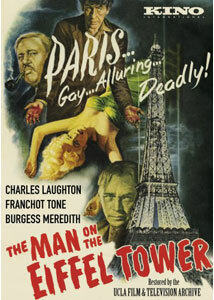 The earliest of the handful of adaptations was this effort with a troubled history, which marked the directorial debut of Burgess Meredith; apparently producer Irving Allen initially was at the helm, but star Charles Laughton disliked him so much that he insisted Meredith be allowed to direct, or he would walk off the picture. Despite Meredith not having any directorial experience, this is an impressively moody debut that has a good deal to recommend it, not to mention some sparking performances from the leads. The story is set into motion by a romantic triangle between Bill Kirby (Robert Hutton), his wife Helen (Patricia Roc), and mistress Edna (Jean Wallace). He can't make any of them happy while he remains penniless and his rich aunt remains alive. After he expresses a wish to pay a million francs for her to be taken out of the picture, a mysterious note offers to do just that. Before long, the old lady is murdered, and Maigret (Laughton) is on the case. All evidence points to a nearly-blind knife sharpener, Joseph Heurtin (Meredith) being the culprit, but Maigret soon comes to the conclusion that Heurtin is just a pawn of psychopathic former medical student Johann Radek (Franchot Tone), who tauntingly leads Maigret on. Things take a turn for the worse when Maigret stages a jailbreak for Heurtin, in hopes he will lead him to the actual culprit, but Heurtin escapes altogether, putting Maigret in the hot seat, to Radek's delight. This is intentionally not much of a mystery; it's clear that Heurtin is indeed a fall guy almost immediately�he discovers the rich aunt, already dead, onscreen� and that Radek is the man behind it; the real interest is in how Maigret can catch up to the audience, and in the suspense generated by whether Heurtin will end up taking the fall if Maigret fails. The script is fairly clever in its cat-and-mouse games, with plenty of sparkling dialogue. There are some particularly wry moments regarding Bill Kirby's romantic predicament, helped out by Chaz Chase (best known for his vaudeville routine where he would eat anything, including lit cigarettes) as a busybody waiter. The cinematography by Stanley Curtiz is suitably dark and noirish, with plenty of shadow and darkness contrasted against the brightly-lit streets of Paris, of course culminating in the climax atop the city's most famous landmark. Meredith contributes some nice moments, especially in montages depicting the passage of time; one features the famous clocks of Paris shifting forward in time, at a variety of often shocking Dutch angles. Laughton is unflappable despite Maigret's problems with this mystery; even though he's the consummate Englishman he manages to pull off the role nicely. Meredith is reliable as the patsy, and Hutton is certainly good enough as the man who sets everything in motion; his nervousness with Maigret, as Hutton bears two women on his arms, is delightful. The women are a bit on the wooden side, other than Belita as Heurtin's money-grubbing wife. She is just shrewish enough and beautiful enough to convince you Heurtin would do anything for her, and is driven to it. But the scene-stealer (and how hard is that, when you're up against the formidable Laughton?) is Tone, who has a calculatedly sinister presence that makes his Radek a compellingly fascinating character, smooth and vile, with a penchant for accurately prophesying when others will meet their dooms. His maniacal delight at teasing Maigret with possible clues and then snatching them back or sending him down blind alleys gives Radek a nasty villainous personality seldom equalled until Hannibal Lecter. There is a bit of reliance on coincidence that makes things a little creaky. That's offset by the constant views of postwar Paris, pulling itself back together. Humorously, Meredith manages to include a necking couple in virtually every shot. While Kirby's problem is too much romance for his own good, there's a romantic sense to the light and the darkness in this little gem. There have been a multitude of public domain releases of this picture, but this is definitely the one to get: it's the full-length version, restored by UCLA, from the two surviving color prints. Image Transfer Review: This picture was shot in a forgotten single strip color process called "Ansco Reversal." The accompanying literature indicates that only two prints of this movie in the color format survive, and they were used for the present restoration. The result resembles something like two-strip Technicolor, weighted heavily towards greens and reds, though on occasion there are some vivid blues. At times, the entire image seems to be sepia, so lifelike color isn't the order of the day. It's a little unstable, but given the source material, there's probably not a lot that can be done. The prints are rather worn, with frequent scratches and speckling present. However, to get the advantage of color, such as it is, it's probably worthwhile to live with the modest print damage. There is very good shadow detail, with one of the prime examples being Heurtin's flashlight against the dark stairs of the aunt's home as he ascends to get himself into trouble. Audio Transfer Review: The English language audio has good presence; despite being in mono, the sound comes from all speakers. There's mild hiss and noise, but nothing surprising for a picture of this vintage. The presence of the stringed instruments of some musicians in a cafe scene is fairly startling in its immediacy. The liveliness of this, and Michel Michelet's score, are beautifully rendered on this disc. Extras Review: The sole extra is a gallery of about a dozen images, with some posters and lobby cards, pressbook advertising, and four stills. A delightful gem of a thriller, restored by UCLA, that offers some terrific performances. Highly recommended.